The following is based on the experience other crabbers have shared over the internet about their Indos, as well as other web research. Brevimanus need temperatures and humidity around 85*F/29.44C and 85% like most other land species. Brevimanus are comfortable in a mix of about 5 parts sand to 1 part bio-matter (such as coconut fiber). *It is also said that c.brevimanus are "shallow molters", this means they prefer to molt under a log or hide, rather than digging down deep like the other species. It's important to feed your land hermit crabs a wide variety of fresh and organic foods. There some reputable vendors who sell good crabby supplements but they should get lots of fruits, veggies, protein, calcium, etc. All land hermit crabs need calcium and protein on a daily basis. You can offer these in the following ways: cuttlebone, coral, oyster shell or egg shells are good for for calcium; nuts, eggs, shrimp and other meats are good for protein. These are just some of the many sources of calcium and protein you can feed your crabbies! Each brevimanus should be able to dip their shell into a pool of dechlorinated fresh water and an ocean grade salt water. 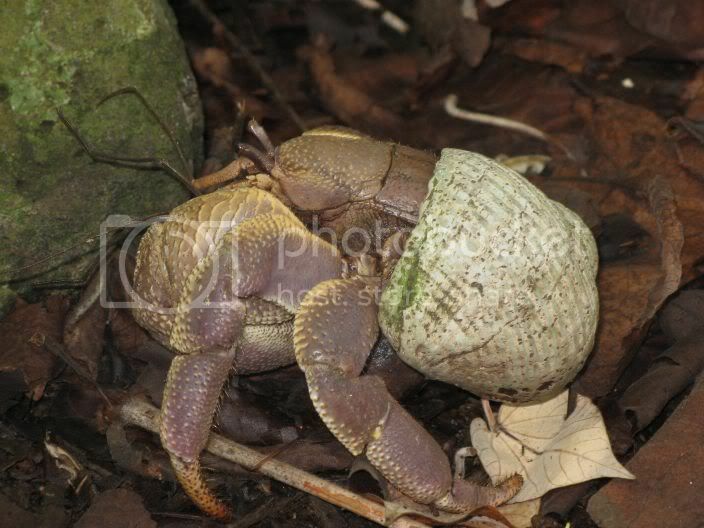 Brevimanus are the biggest of all the true land hermit crabs, they will get much bigger than your other species. They also have a very distinct looking claw that is very big proportionally, flat on the inside and has a different 'seam' than most other species. Their exo is also much thicker & harder than our other crabby friends. Be sure to have plenty of things for them to climb on and plenty of places for them to sleep in. Although in the wild crabs naturally segregate by species about 98% of the time, c. brevimanus get along well with c. clypeatus (PP or Purple Pinchers) and c. perlatus (Strawberries). You should never have just one of a species, get Crabby a species-buddy! C. brevimanus should NEVER be kept with c.violascens since violascens are known for digging up molters.